The White-capped Monarch is a small bird of the flycatcher family, found only on a few islands in the central Solomon Islands. 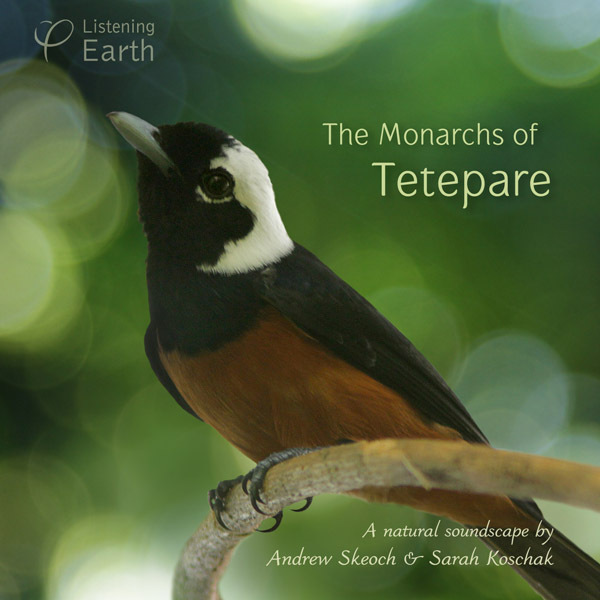 At 5am, on the rainforested island of Tetepare, they begin their hauntingly beautiful predawn singing. Each bird gives a series of single, pure-note whistles - hesitant and slightly tremulous. At first only one or two birds call, ethereal and hypnotic in the night. The magic develops as more birds join in, each bird singing its own note, together making a kind of organic music; an elfin choir in the forest. A chorus of nocturnal insects call softly, along with wildlife characteristic of these Pacific islands; eyelash frogs, 'kissing' bats, megapodes, white-eyes and koels. The sound of waves breaking carries faintly from the distant reef. This album is a single continuous recording - a deeply peaceful and unique soundworld. "There are times in our field recording when we come across something utterly unexpected and wonderful. This was one of those occasions. "At first I was enchanted with the idea that these birds were singing in a musical scale. Actually, it seemed more like one of the old medieval church modes, which predate our modern scales, and specifically, the Aeolian mode. This we would now call a minor scale. "However nature is not a musical system, and whilst our music is specifically pitched, these birds weren't singing like that. A musician may describe them as singing in micro-tones, quavering their notes and gliding them almost imperceptibly. In reality, it would be more accurate to say that a musical ear may perceive the illusion of a scale, but frequently, they'd sing tones that were not on the modal scale at all. 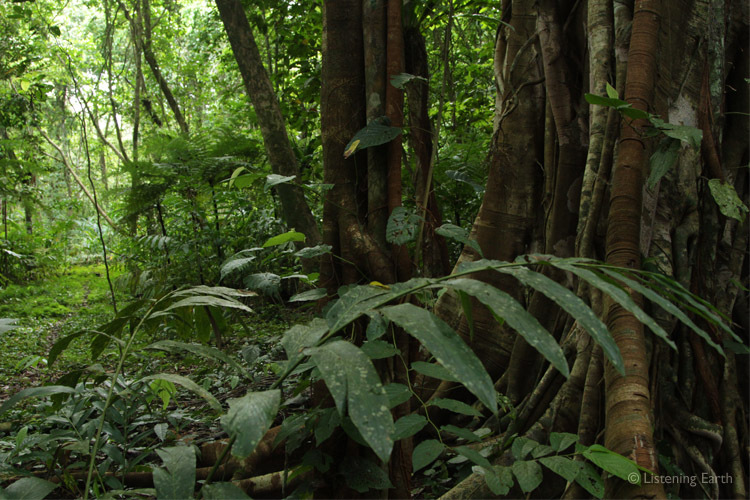 "What I can say is that the whole experience of being in the rainforest, with faint shafts of moonlight penetrating the canopy, and these wonderful sounds around us, was utterly enchanting. Deeply relaxing. It was a unique occasion, rarely heard, and only in that localised region of the Solomon Islands. "We decided that the effect is so restful that many would enjoy listening to the complete recording. It is one of those soundscapes that just lulls you hypnotically, yet it is always changing." In particular we'd like to acknowledge the friendship of Mary and Twomey, the latter for his gentle companionship as our local guide while on the island.